A menagerie of deadly monsters for the world’s greatest roleplaying game. Purchase it at your local game store, book stores such as Barnes & Noble, or online at retailers like Amazon. You can also find the Monster Manual available via Fantasy Grounds and Steam, as well as Roll20 and at D&D Beyond. The winners of the 2015 ENnie Awards, an annual fan-based celebration of excellence in tabletop roleplaying gaming, were announced at this year's Gen Con. 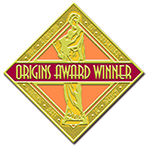 The winners of the 2015 Origins Awards were selected by the Academy of Adventure Gaming Arts & Design, presented at the Origins Game Fair in Columbus, Ohio.